This tote bag is an original pattern that I made up to try out a couple of new techniques. Click on any of the pictures to see the bigger version. I knit it from one strand of Berroco Glace in # 2531 Oregano (Glace is 100% viscose rayon) held together with one strand of South West Trading Company Phoenix in either Harvest or Napa Valley (Phoenix is 100% soy silk). Harvest is the solid green seen in the bottom and in the band right under the drawstring. Napa Valley is the multi-color green, cream and purple seen around the middle of the bag, on the opening above the drawstring, and in the I-cord drawstring itself. I used two skeins of the Glace, and about 1/2 of each skein of the Phoenix. The Glace added a nice shiny touch to the matte finish of the Phoenix. 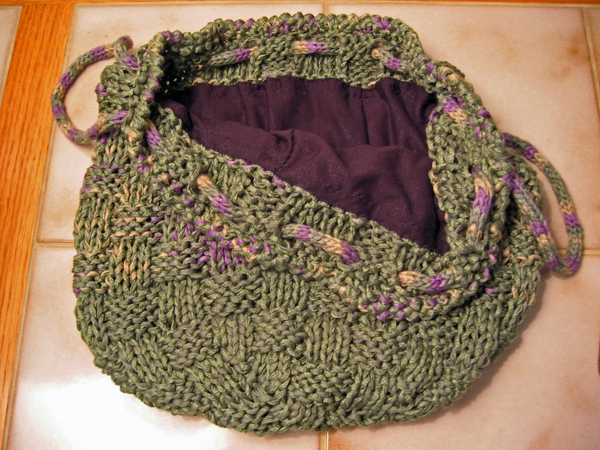 The bag was knit on US #11 needles in a basket weave pattern. I knit from the middle of the bottom up toward the top. Near the top I made YO eyelets for the drawstring. I used a crocheted bind-off: One single crochet in each stitch, and then one row of crab stitch (backward single crochet) around the top to make the sort of basket-ish finishing twist. The first picture shows the bag full of goodies. 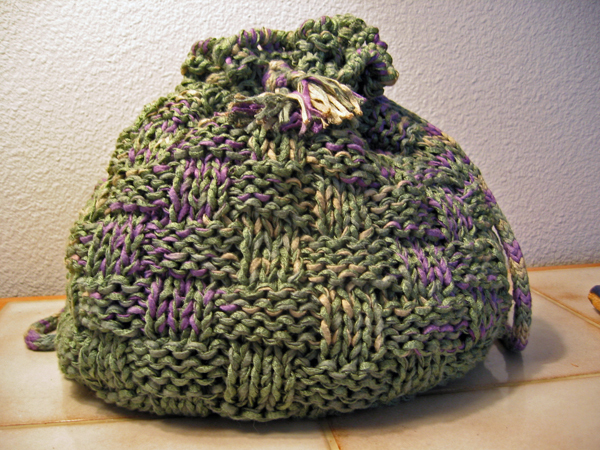 It’s a medium-sized bag (or that’s what I would call it), and is holding six 50-gram hanks of yarn with room to spare. 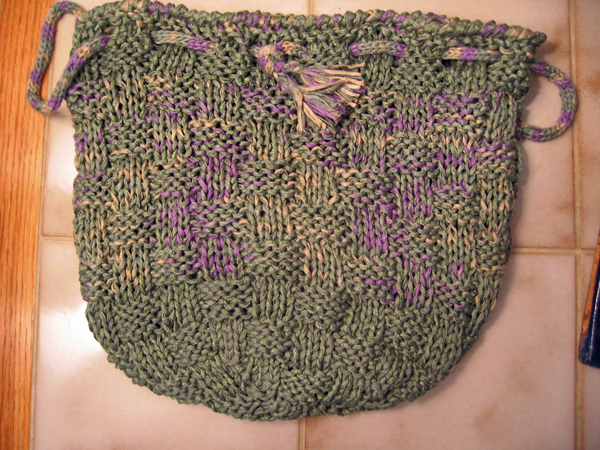 The second picture shows the bag laid out to show the colors and the basket weave pattern. The third picture shows the bottom of the bag. I cast on 5 stitches and increased every row until I had 80 stitches. The basket weave pattern is worked over multiples of 8 stitches. I was quite please with myself for keeping the pattern going from the very beginning up throughout the increases. Like its cousin the Red Tote Bag, this bag was lined in sparkly, midnight-purple Lycra. The stretchy lining means that the bag will still be able to stretch to hold a lot of stuff, but means that it’s not as stable as it would have been if I’d lined it with a firmer fabric. The lining was attached to the row of purl bumps on the row right below the drawstring eyelets. 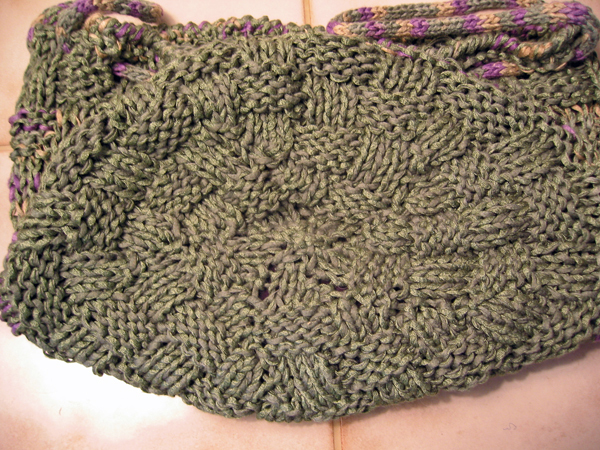 It didn’t take very long to knit — I estimate about 1 hour for the I-cord, 4 hours for the bag itself, and 1 hours to make the lining and sew it in. I had a lot of fun making this bag and I might be tempted to make another one if so many other projects weren’t waiting in the wings. But it will be a great bag for hauling smallish projects around out in public. In other knitting news, I’m almost finished with E’s socks (really!) and I’ve picked up 6 skeins of Novo Yarns Elsebeth Lavold Silky Tweed in color #13 Cool Blue, which is a sort of tweedy faded denim color. This will be used on Clapotis #2. I plan to take it to work to keep my shoulders warm on days when the air conditioner has turned into a wind tunnel.